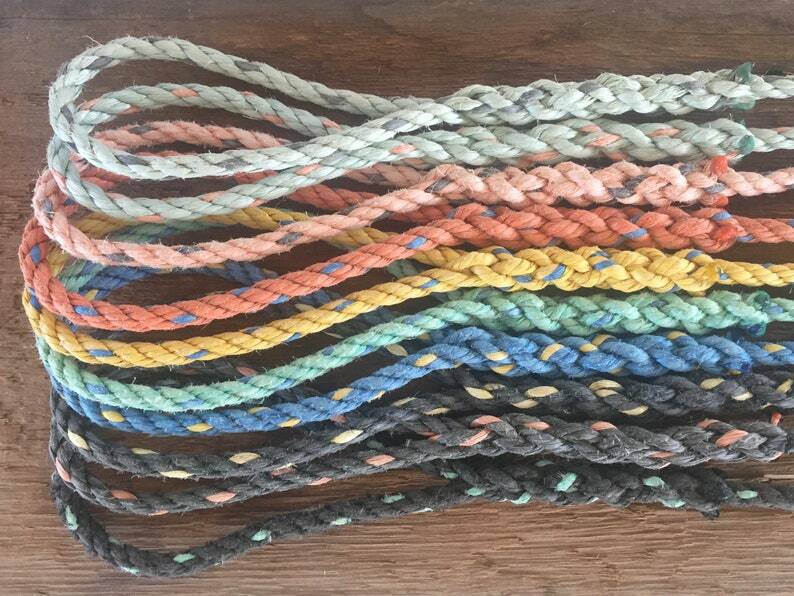 Our 100% salvaged lobster rope dog leashes are one of a kind creations made in Maine. Keep your pooch active with this durable dog leash. It's a great lead for walking, running, hiking and more. The perfect nautical look for beach and boat. It is constructed from a single strand of 3/8" rope recycled from the lobster fishing industry. The rugged rope has been neatly hand spliced, one end with a handle and the other with a new metal swivel eye trigger snap. The leash measures approximately 6 feet in length and is suitable for medium to large dogs. Please contact us if you would like custom colors, lengths, or styles. All rope has spent considerable time around the ocean. It has soaked in the salt and scent of the sea and may show signs of natural wear, fading and imperfections. Check out our shop's other dog leashes! Observe your pet's behavior for suitability. Great gift! My sister loved it! Thank you.